Greenlight Networks (NY) Archives · Stop the Cap! Spectrum customers living in areas wired for fiber optics get substantially better discounts for longer periods of time than those living in areas where anemic phone company DSL service is the only competition. 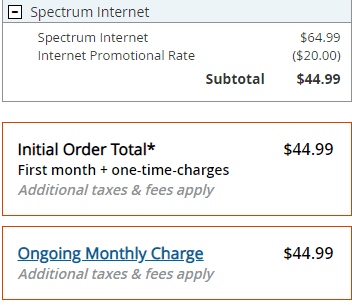 Charter Communications, like many cable operators, asks all prospective customers to enter their complete mailing address, claiming prices “vary per location.” What the company does not say is that it maintains a database of addresses where fiber-fast competition is currently available and only offers the best deals to those locations. In Rochester, N.Y., Spectrum competitor Greenlight Networks has made headway installing fiber to the home service in select neighborhoods in the city and suburbs. As fiber service becomes available, some Spectrum customers start switching to Greenlight, which markets 100/20 Mbps service for $50/mo, 500/50 Mbps for $75/mo, or 1,000/100 Mbps for $100/mo. 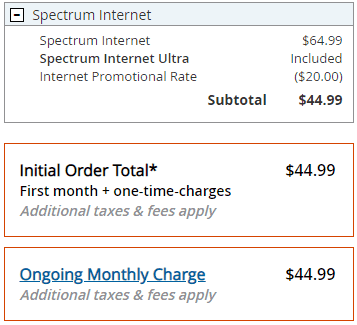 In response, to keep customers, Spectrum offers 24 months of reduced pricing on its internet package. But your address must match Spectrum’s database as being within a competitive service area. Otherwise, the deals will not be so good. Stop the Cap! found dramatic differences in prices between addresses nearly across a street from one another – one wired for Greenlight Fiber, the other not. 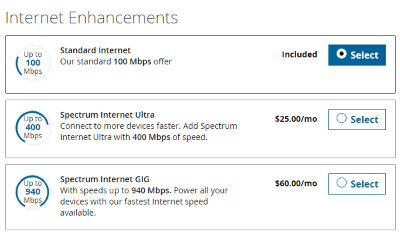 In Greenlight service areas, Spectrum now undercuts Greenlight’s pricing by offering Spectrum Ultra 400 Mbps service for $5 less than what Greenlight charges for 100 Mbps. 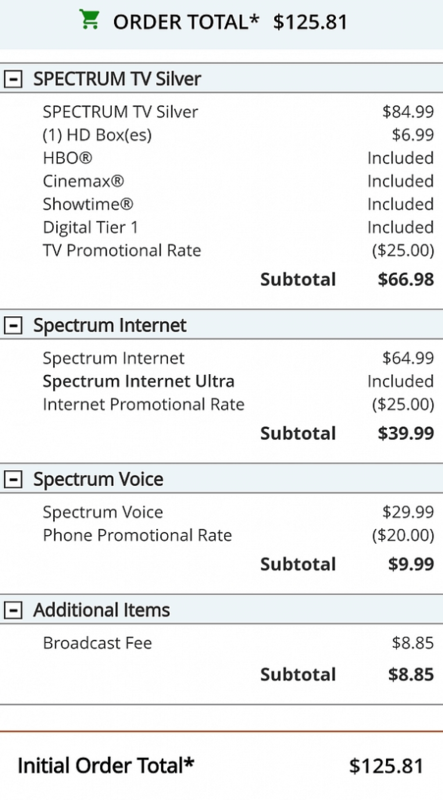 “Racerbob,” a DSL Reports reader in Webster, N.Y., discovered the same “enhanced offers” as an ex-Spectrum customer. He switched to Greenlight three months ago. He discovered if he added a Spectrum cable TV package, the price for 400 Mbps Ultra internet service dropped even lower, to $39.99 a month for two years. Addresses used for comparison were in zip code 14618, with verified access to Greenlight at a street address to represent the “competitive” service area and verification Greenlight was not available at the address used for “non-competitive” service area. *-Although a setup fee was found on the final checkout page in both competitive and non-competitive service areas, it was only actually charged in non-competitive service areas during our investigation. As gigabit internet becomes more common across the United States, some ISPs are seeking a speed advantage by offering even faster speeds to residential and business customers. On Tuesday, Nokia announced Frontier Communications and Rochester, N.Y.-based Greenlight Networks would be upgrading their fiber networks to the company’s XGS-PON solution, which can handle 10 Gbps upload and download speeds. Many existing fiber networks currently rely on GPON (gigabit passive optical network) technology — which allows one fiber in a bundle of fibers to service multiple homes and businesses. GPON networks are typically capable of download speeds of 2.488 Gbps and shared upstream speeds of 1.244 Gbps. Many ISPs using GPON technology typically offer fast download speeds, but often slower upload speeds. Next generation XGS-PON allows up to 10 Gbps in both directions over existing fiber networks. In fact, the technology is future proof, allowing operators to immediately upgrade to faster speeds and later move towards Full TWDM-PON, an even more robust technology, without expensive network upgrades. Most providers are leveraging XGS-PON technology to deliver symmetrical broadband — same upload and download speeds — to residential customers and to expand network capacity to avoid congestion. XPS-PON technology also supports faster-than-gigabit speeds than can be attractive to commercial customers. Frontier intends to deploy Nokia’s technology in ex-Verizon markets in California, Texas, and Florida, beginning in Dallas-Fort Worth. It will allow Frontier to beef up its FiOS network and market stronger broadband products to Texas businesses. In Rochester, Greenlight will use the technology to upgrade its fiber service, which competes locally with Frontier DSL and Charter/Spectrum. Spectrum recently introduced gigabit download speed in Rochester. Greenlight can now expand beyond its 1 Gbps offering, but more importantly, increase its maximum upload speed beyond 100 Mbps. Nokia points out its XGS-PON technology may also be very attractive to wireless companies considering deploying 5G services. Extensive fiber assets available in area neighborhoods will be crucial for the success of millimeter wave 5G technology, which relies on small cells placed around neighborhoods and fed by fiber optics. Rochester billionaire and philanthropist Thomas Golisano is seeking expedited regulatory approval from New York’s Public Service Commission to acquire Rochester-based Greenlight Networks, LLC, a fiber to the home network provider for an undisclosed sum. Greenlight Networks has been slowly overbuilding Charter/Spectrum and Frontier Communications’ service areas in eastern Monroe County since 2012, offering subscribers gigabit internet access. But time may be running short for Greenlight’s competitive broadband speed advantage. Charter Communications is reportedly planning to introduce gigabit service as early as April 25th throughout upstate New York, except for Buffalo. The urgency of the transaction’s approval is clear in the companies’ filing with state officials requesting an expedited review and approval of the transaction. Greenlight’s success is likely dependent on its ability to rapidly expand its fiber optic network before its biggest competitor, Charter’s Spectrum, capitalizes on its forthcoming ability to match Greenlight’s download speeds. Greenlight receives praise from subscribers lucky enough to live in a neighborhood reached by its network. But residents also report frustration over the slow pace of the company’s fiber network expansion, particularly in suburbs west of the Genesee River that bisects the city of Rochester. Golisano’s Grand Oaks LLC of Pittsford, N.Y. promises customers the acquisition will not result in any changes in Greenlight’s rates or its terms and conditions. The petition claims the acquisition is in the public interest because it will offer Greenlight much-needed additional capital to accelerate deployment of its fiber network inside Rochester and beyond. Greenlight’s website suggests the company is considering expansion into the New York State cities of Albany, Binghamton, Buffalo, Ithaca, Syracuse, and the Finger Lakes Region. 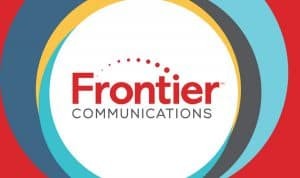 In Connecticut, the company is considering serving Bridgeport, Danbury, Hartford, New Haven, and Stamford (the corporate home of Frontier Communications). Grand Oak also promises to grow jobs at Greenlight and increase operational efficiency at the company. Golisano is well-known in Rochester as an entrepreneur, philanthropist, and civic leader. Golisano founded Paychex, a leading national payroll service provider in 1971. 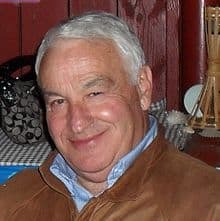 After his retirement in 2004, Golisano has been actively involved in local civic causes and advocates for policies promoting improvement in the economy of western New York State. The application is likely to be approved, but not soon enough to combat Charter Communications’ accelerated broadband upgrades across New York State. By early summer, Spectrum customers across New York State will receive 200 Mbps Standard service, 400 Mbps Ultra service, or 940 Mbps (nearly gigabit) Gigabit service from the cable operator at prices ranging from $65-125 a month. 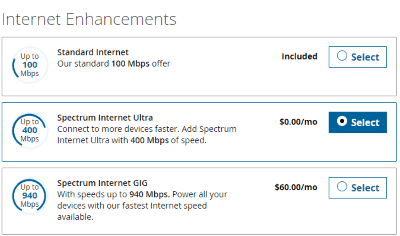 In contrast, Greenlight currently offers customers 100 Mbps for $50, 500 Mbps for $75, or 1,000 Mbps for $100 a month. Vice President Biden in Rochester, N.Y.
Vice President Joe Biden and New York Gov. Andrew Cuomo today announced Rochester, N.Y., a city notorious for its slow broadband, will be the home of the $600 million Integrated Photonics Institute for Manufacturing Innovation, a hub supporting the development of photonics — technology that powers everything from fiber optic broadband to laser surgery. Rochester, the home of dramatically downsized household names like Eastman Kodak, Xerox, and Bausch and Lomb, could see thousands of new high technology jobs created in the western New York city to develop new products and services that depend on light waves. Slaughter reportedly spent three years working to bring the center to Rochester and helped secure $110 million from the Defense Department and another $500 million in state and private sector funding to finance its development. The project could prove transformational for a community ravaged by downsizing, most dramatically exemplified by Eastman Kodak, which had 62,000 workers in Rochester during the 1980s but employs fewer than 2,500 today. 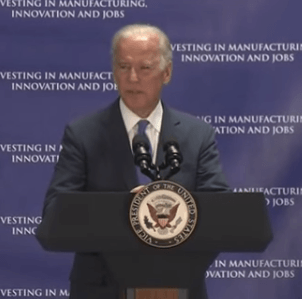 Today, Rochester’s largest employers are no longer manufacturers. Health care service providers now lead the way, including the University of Rochester Medical Center/Strong Health (#1) and the Rochester General Health System (#3). Upscale grocery chain Wegmans calls Rochester home and is the community’s second largest employer. The bureaucracies that power the Rochester City School District and Monroe County Government are also among the area’s top-10 employers. Despite the job shifts, the fact 24,000 workers in the region are already employed in photonics-related jobs may have been a deciding factor in selecting Rochester for the center. “The photonics center we are now bringing to Rochester will harness the power of the Defense Department and the prowess of Rochester’s 24,000 employee-strong photonics industry and focus it like a laser beam to launch new industries, technologies and jobs,” Sen. Charles Schumer (D-N.Y.) said in a statement. Employers, small business start-ups and workers moving into the region are likely to be considerably less impressed by Rochester’s incumbent telecommunications service providers. Although institutional and large commercial fiber networks are available to those with deep pockets, with the exception of Greenlight Networks, a local fiber to the home retail overbuilder providing fast gigabit fiber Internet to a tiny percentage of local residents, the area’s fiber future remains bleak. Time Warner Cable, by far the largest Internet provider in the region, has left Rochester off its Maxx upgrade list, leaving the city with a maximum of 50/5Mbps Internet speed. Frontier Communications still relies on 1990s era DSL service and the anemic speeds it delivers, evident from the company’s poor average speed ranking — 11.47Mbps — less than half the minimum 25Mbps the FCC considers broadband. The performance of the two providers has dragged Rochester’s broadband speed ranking to an embarrassingly low #336 compared with other communities in New York. Suburban towns in downstate New York enjoy more than twice the speed upstate residents get, largely thanks to major upgrades from Verizon (FiOS) and Time Warner Cable (Maxx). But even compared with other upstate communities, Rochester still scores poorly, beaten by small communities like Watertown, Massena, and Waterloo. 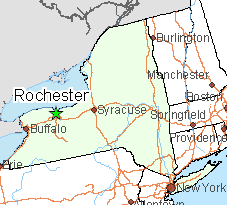 Suburban Buffalo, Syracuse, and Albany also outperform Rochester. Raleigh is an AT&T U-verse with GigaPower city with 1,000/1,000Mbps service for $120 70 a month. This article was updated to correct the pricing of AT&T U-verse with GigaPower in Raleigh, N.C., with thanks to reader Darrin Evans for the corrected information. Greenlight Networks, a fiber overbuilder serving select neighborhoods in the greater Rochester, N.Y. area, today announced it was cutting the price of its gigabit broadband offering by 60 percent. The new $100/mo price takes effect immediately and will increase competition for local incumbents Time Warner Cable and Frontier Communications. Time Warner currently sells up to 50/5Mbps service and most Frontier Communications customers qualify for DSL at speeds of 10Mbps or less. Greenlight also announced it is waiving its usual $100 installation fee for customers signing up for gigabit service. Greenlight president Mark Murphy said he wants Rochester to be considered America’s next “Gig City,” and emphasized Greenlight does not charge hidden fees or surcharges and has no usage caps. The company also sells a less expensive 100/20Mbps tier for $50 a month and recently introduced a 500/50Mbps tier for $75 a month. The upload speed for the gigabit tier is 100Mbps. Greenlight currently offers service in a few neighborhoods in Brighton, East Rochester, Henrietta, Irondequoit, Pittsford and Rochester where enough customer demand can be demonstrated. Potential customers sign up on the company’s website (temporarily disabled) and are notified when service becomes available. Greenlight now only sells broadband service and has stayed out of the cable television and telephone business.